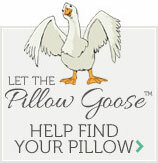 National Sleep Products � Home Spun Polyester Fiber Pillow Inserts are perfect for decorating any room in your home. The Home Spun Polyester Fiber fill is hypo-allergenic, so that even the most sensitive person can have around their home. National Sleep Products � Home Spun Polyester Fiber Pillow Inserts have single chamber designs and is generously filled so that it does fill out any decorative pillowcase you have perfectly. In addition, with a durable 70% Polyester/ 30% Cotton blend cover, National Sleep Products � Home Spun Polyester Fiber Pillow Inserts will last and will prevent any fill from spilling out. National Sleep Products � Home Spun Polyester Fiber Pillow Inserts are certainly high-quality products that will add finishing touches to your home!